For the first time, a mammal has been driven extinct by human-caused climate change. 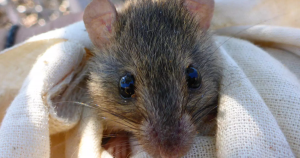 The Australian government has declared a small rodent called the Bramble Cay mosaic-tailed rat as extinct. The rising sea level coupled with worsening storms wiped out almost all of its food supply on the small island it inhabited, according to Scientific American — a grim reminder of bleak effects of humans on the global environment. This year, Australia’s Department of the Environment and Energy put out a press release describing a call to increase its efforts to protect the country’s endangered and threatened inhabitants. The press release recommended moving the Bramble Cay rat, which Scientific American reports hasn’t been spotted since 2009, from being endangered to officially extinct. The Australian government didn’t pull punches — human-induced climate change was listed as the primary cause of death for the small rodents. While the loss of a rodent that only lived on one small island may not be a death toll for the entire world, it’s a stark reminder of the irreversible impact human civilization is making on the planet.